Saturday July 11th 1925 I did some sewing in AM and rested after dinner. Then threaded beads for Hattie. It has been a frightfully hot day. Ott & Fannie started to drive to LaGrange. We spent the evening on the porch. Sunday July 12th 1925 Very warm. I did not attempt to go to church with Hattie. Wrote L D L. Slept awhile in afternoon Later Rob took us a ride. Evening on the porch. Monday July 13th 1925 I was busy sewing all AM. Hattie down town. I had letter from Ida. Busy with my own things in afternoon. Hattie to Home board meeting. 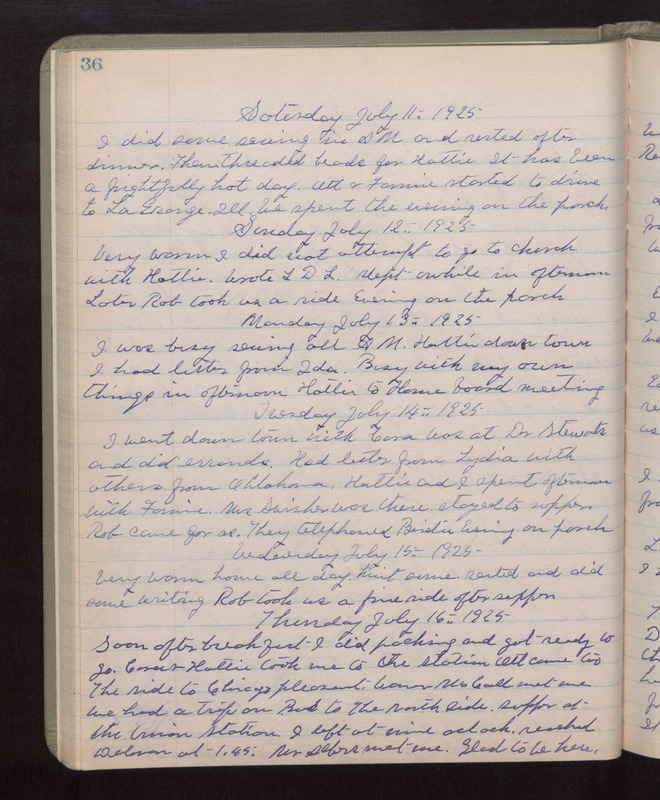 Tuesday July 14th 1925 I went down town with Cora, was at Dr Stewards and did errands. Had letter from Lydia with others from Oklahoma. Hattie and I spent afternoon with Fannie. Mrs Swisher was there. Stayed to supper. Rob came for us. They telephones Birdie. Evening on porch. Wednesday July 15th 1925 very warm, home all day. Knit some, rested and did some writing. Rob took is a fine ride after supper. Thursday July 16th 1925 Soon after breakfast I did packing and got ready to go. Cora & Hattie took me to the station. Ott came too. The ride to Chicago pleasant. Warner McCall met me. We had a trip on Bus to The North Side. Supper at the Union Station. I left at nine oclock. Reached Delavan at 1.45. Mr Albers met me. Glad to be here.